There is something particularly satisfying about the feel and action of a good natural stone which a coarse synthetic cannot match. Simon Fairlies’ article in Windrow 9 (Feb 2015) highlighted the endangered status of quality natural whetstones, particularly two favourite stones the Bregenzer and Rozsutec. I also enjoyed reading the reports by Dutchman Henk Bos to which the windrow article refers and the wonderfully obsessional level of detail and devotion to the subject of whetsones therein. They included reports of Henk’s study tours to whetstone quarries of Europe, including a number in North Wales… where it happens I had just booked a family holiday – bonus! 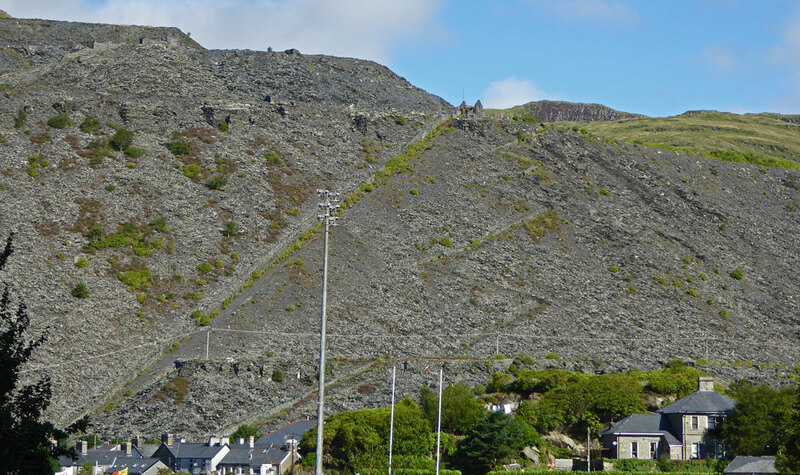 We stayed for a week in “The old quarry Hospital” Blaenau Ffestiniog on the edge of the Snowdonia National Park (the building in the bottom right corner of the photo with the main inclines to the Oakeley Slate quarry rising behind). 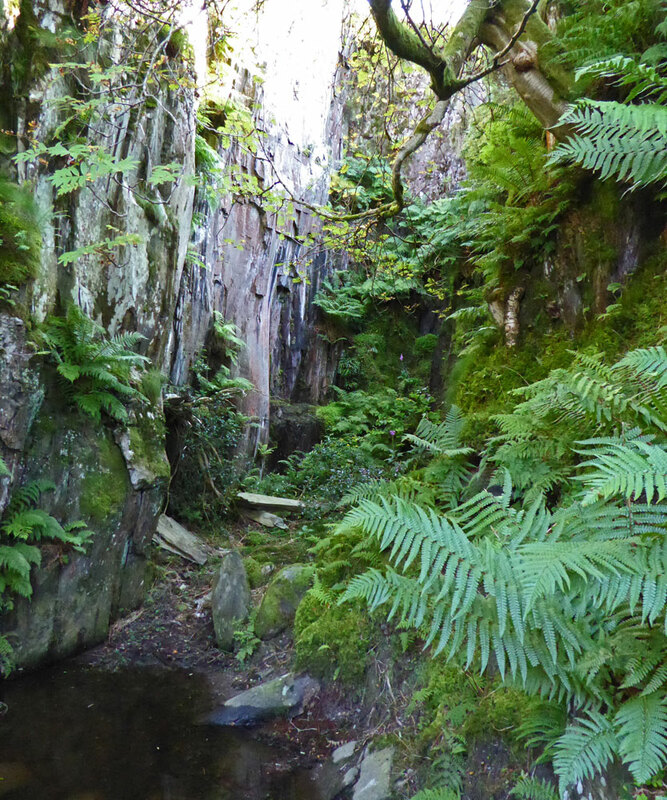 During my stay as well as hiking, zip wires and white-water rafting I managed to fit in visits to three whetstone/hone locations: Penrhiw Hone quarry, Llynn Idwal Quarry and Inigo Jones Slateworks. My first excursion to Penrhiw Hone quarry on the slopes of Moel Siabod was the least successful as in spite of very good map and geograph linked photos of the quarry and associated features (including tantalisingly a pile of abandoned precut stones!) all were frustratingly hard to locate on the ground. The quarry lies hidden amongst an active conifer forest plantation with sections both cleared and replanted since maps were last drawn. I only managed to locate the quarry face at a distance across impassable blanket bog before the light faded. The second was a visit to Lynn Idwal Quarry on my way back from a glorious hike across the Glyder mountains. This small quarry is very easy to locate being only a few 100 metres from the main car park in the valley. I recovered a sample of rock with the lustre described by Henk Bos to experiment with; although at first inspection it does not appear too promising a material for a scythe stone. My final visit was to the Inigo Jones Slateworks mentioned in Henk’s report. Inigo Jones (est 1861) still manufacture whetstones from welsh slate with the “Dragons Tongue” Brand (of the flat oblong variety for tool sharpening). I had emailed my interest to John and Roger directors of Inigo Jones before I visited so when I called in on the last day of my holiday I was able to buy a standard Dragons tongue whetstone and also have a custom scythe stone made whilst I watched on. In the skilled hands of Roger (who has been working slate for over 40 years), the cutting and grinding process only took a few minutes to complete and a beautiful sleek black slate whetstone was born. Henk Bos rated this stone highly being of a fine grain grade similar to the Rozsutec. A good whetstone needs hard fine angular grains held together in a strong mineral matrix (the glue). The bonding of the matrix is of particular relevance for a scythe whetstone as it gets more rough hard use and knocked about more in the field than a bench hone. As a botanist rather than geologist I find the grain size and composition of rock is quite hard to assess by eye (even with a hand lens), and the feel of the rock gives only a coarse indication of grade. The best test is therefore just to try out the stone. Back home mowing my own meadow I was able to test my Dragons tongue scythestone against my trusted Rozsutec . Alternating between the Welsh and the Slovakian stone I found the results in terms of edge sharpness and time between honing difficult to separate objectively as both gave good results. Subjectively I would say that the dragons tongue had a very positive feel developing a slight slurry (less than some other stones we have tried). The Rozsutec is a hard clean stone that slips readily over the blade edge seemingly doing less work but in effect was probably the quicker stone. Slate is a fine grained foliated metamorphic rock mainly composed of hard fine quartz grains in a matrix of softer mica minerals. The weakness of slate as a whetstone is the strength of the bonds between the laminate sheets which can result in flaking. The stone I had made was cut so that the curved faces are across harder end grain. In use the corners are already beginning to flake. Flat whetstones use the flat plane as the sharpening surface. I did discuss whether a stone cut at 90 degrees to my stone would work. In this orientation the curved edge would need to cut through several layers in its radius, which might also lead to flaking? I would need to get some more cut to test this. As I was packing to leave Dai Jones the owner of our holiday let Quarry Hospital came over and asked how the week had been. He also apologised that some of the grass hadn’t been trimmed as his strimmer was broken awaiting spares. I said if he had told me earlier I could have sorted it for him, I showed him my scythe and the slate whetstone. “Ah, he said, that slate is from a quarry on the other side of Blaenau; Oakeley quarry above us we reckon is best for sharpening knifes around here”. Dai as it turns out is also slate craftsman and I am sure we could have done a deal for some Oakeley whetstones if we had had this conversation earlier in the week. This entry was posted in Sharpening & peening, Tools & equipment and tagged scythe, slate, whetstone. Bookmark the permalink. I have really enjoyed your videos and recounting of your visit to Wales. I am proprietor of The Perfect Edge in Shrewsbury, MA, USA and have a large stone collection of hones of all types from around the world. Will have to get to Wales!